For three decades, Dr. Gerald Bull was one of the world’s most brilliant and accomplished aeronautical engineers involved in research using long-range artillery capable of launching satellites or warheads into sub-orbital space. It was the military application of his technology which landed him in Allenwood Federal Prison Camp in Pennsylvania for six months in the fall/winter of 1980 for breaking a UN embargo on weapons sales to the apartheid government of South Africa. Bull had refused all requests for media interviews during this period of his life, but I wrote a letter to him at Allenwood asking for a meeting in person and he agreed. I remember clearly the date of that interview — December 8, 1980 — because it was the day Mark Chapman shot John Lennon. Bull told me that he felt betrayed by the Government of Canada and by the U.S. defense establishment, with whom he had worked to develop a howitzer capable of lobbing artillery shells over 30 miles. For my part, it took over three months and several rewrites toning down my original story before senior Gazette management would agree to run an article about Bull, described by one irate editor as “a jailbird” denigrating the Canadian and U.S. governments. By the time The Gazette published a story on Bull on March 21, 1981, my jail interview was out of date and I was forced to find a more current leadoff for the story based on his job search outside North America. Bull ended up establishing his business headquarters in Belgium. Ten years after his release from jail, on March 22, 1990, two assassins using silencers pumped five 7.65 mm bullets into the back of his head as he returned home to his sixth-floor apartment in Brussels. No arrests were ever made. There has been conjecture that he was killed by Mossad, the CIA or Savak, the Iranian secret service, because of work he was doing for Saddam Hussein to develop an Iraqi supergun known as Project Babylon. PHOTO: M. Wade, Encyclopdia Astronautix, and Berliner-Ultrasonics. Dr. Gerald Bull with one of his 16" artillery guns at Highwater, Que. Dr. Gerald Bull, the brilliant Canadian-born scientist who was jailed last year for shipping weapons to South Africa, has completed his prison term and is now in Europe checking out job offers. Bull’s wife, Noemi, said in an interview at her St. Bruno home yesterday that her husband could wind up working in South Africa. Other job offers he has under consideration are in Britain, Belgium, France, Switzerland, Israel and Egypt. Bull has vowed never to return to Canada or the United States. “He’s still angry and sad about what’s been done to him,” Mrs. Bull said. Although she loves Canada and hates the thought of leaving, she and the three youngest of her seven children will join him as soon as he decides where to settle. Their departure could bring an end to the strange saga of Bull, a child prodigy who went on to become one of the world’s leading weaponry experts. During the 1970s, Bull 52, developed long-range 155-mm artillery guns and shells which could shoot farther and carry a bigger warhead than any others produced in the world. Friends and colleagues describe him as a gentle but emotional man who sees it as his patriotic duty to develop weapons to stop the spread of communism. Since the South African affair broke, Bull’s company, Space Research Corp. (SRC) and its subsidiaries have gone bankrupt. Bull earned about $100,000 a year as president of the company. Bull’s legal problems began in 1977 when Joshua Nkomo, then a Zimbabwe guerrilla leader, told an Ottawa news conference that South Africa and Zimbabwe (then Rhodesia) had received more than 900 metric tons of armaments from Canada. The Royal Canadian Mounted Police (RCMP) and the U.S. justice department began investigating Bull’s company, SRC, a 9,000-acre artillery range and research compound which straddles the Canadian-U.S. border at Highwater, Que., and North Troy, Vt., 90 miles southeast of Montreal. Both Canada and the U.S. have banned weapons exports to South Africa in compliance with a United Nations embargo against that country because of its racial segregation policies. In March 1980, Bull, as founder of the company, and Rodgers L. Gregory, former president of the U.S. subsidiary in North Troy, pleased guilty in Rutland, Vt. to exporting at least 30,000 projectile forgings, two 155-mm canons and a radar tracking system to South Africa. U.S. Chief District Court Judge James Holden suspended six months of a one-year sentence for each man and fined the company $40,000. They began their sentences last Oct. 1. Meanwhile, the company was fined $50,000 in Montreal last August after pleading guilty before Sessions Court Judge Rhéal Brunet to making false statements on federal export permits needed to export military equipment. The Crown alleged that the ports of destination for at least 33,000 shell forgings and artillery components were listed as Spain, Antigua and Barbados, when, in reality, they were heading for South Africa in 1977 and 1978. Throughout the investigation and court proceedings, Bull refused to talk to reporters. But a short time before his release from Allenwood Federal Prison Camp in Pennsylvania, he relented and agreed to be interviewed by a Gazette reporter. Despite incontrovertible evidence that the weapons ended up in South Africa, Bull insisted that he does not know for a fact that the weapons were shipped there. The deal was arranged by the Belgium armaments firm Les Poudrières Reunies Belgique (PRB), in which SRC had a 45 per cent interest, he said. He was under the impression the weapons were destined for Spain. No proof was ever presented before the courts because Bull pleaded guilty to the charges on the advice of his lawyers who told him it was the quickest way to end costly court proceedings. However, in a show broadcast in 1991 by the CBC's Fifth Estate, journalist Eric Malling traced three separate shipments of weapons from SRc to South Africa in 1977 and 1978. Even though the weapons ended up in South Africa, Bull said he has no regrets or moral qualms. Bull, a Catholic who attends church every Sunday, said he disagrees with South Africa’s racial policies, but believes it should be given the weapons to defend itself. Bull, who contends he has no racial biases, said such long-range artillery is used in battles against Communist-backed nationalist groups operating from nearby countries. Bull is a brilliant theorist who has mastered some of the most complex scientific principles but has adopted a simple political stance — communism must be contained at all costs. A close friend, who asked not to be identified, said Bull has become so ensconced in his scientific work that he sometimes appears to be out of touch with reality. Bull himself thinks there is ironic injustice in his being prosecuted for sending arms to South Africa, while the U.S. government supplies weapons to dictatorships and military juntas, such as those in South Vietnam, Iran and Chile. The U.S. government is currently sending arms to El Salvador and has said it is ready to send weapons to Argentina. This week there were reports that U.S. President Ronald Reagan was considering inviting South Africa’s Prime Minister Pieter Botha to America — but the reports were heatedly denied by the U.S. State Department. Bull, who spent two months last summer recovering from mental and physical exhaustion at a Connecticut hospital, believes the Canadian and U.S. governments are persecuting him with the aid of the press because he has been outspokenly critical of their defence policies. Bull appears to be a striking paradox. In a matter of seconds, he can transform himself from a shy, soft-spoken man into a strident militant who speaks of the need for sophisticated weaponry to meet the Communist threat. “Canadian civil servants are morons and Communists, who have sabotaged the Canadian defence industry for the last 25 years,” he said. “All you have left (in the defence department) are the dregs, the scum. The New York City police force is about as large as the Canadian defence department and far better equipped. The United States does not fare much better in his opinion. “They’re a gutless, confused bunch as they showed when they tried to put a few helicopters in Iran to rescue the hostages there,” he said. Bull is a bitter man. The court fights in the U.S. and Canada have cost him more than $100,000. Following the adverse publicity of the South African affair, all North American contracts dried up, forcing his company, SRC, into bankruptcy last year. Bull threw his hands in the air when he was asked about a British broadcast last fall charging that he helped Israel and South Africa develop nuclear weapons. The show, World in Action, based its finding on the fact that a U.S. satellite reported in September 1979 what appeared to be a nuclear blast over the Atlantic ocean close to the South African coast. The show deducted it must be one of Bull’s shells since the satellite showed it wasn’t a rocket. “That’s a complete, utter lie,” Bull said. “We never worked with nuclear weapons at Space Research.” Bull also denied a report published last year by U.S. journalists Sam Hemmingway and William Scott Malone that the South African government owns 20 per cent of SRC. In fact, 20 per cent of SRC is owned by Space Capital International, a former Howard Hughes’ Dutch company, according to a copy of the purchase agreement between that company and SRC, dated July 6, 1977. However, Hemmingway and Malone obtained copies of confidential company documents which show that two South Africans represented Space cap[ital International at a meeting in London in July, 1977, to work out details of the investment agreement. One of the men was J. S. Cotzee, chief manager of commercial sales for Armscor, the arms manufacturing subsidiary of the South African military. The other man was Frank Nel, general manager of Armscor’s industrial division. Bull was born in North Bay, Ont., and is fluently bilingual. His mother, who was French-Canadian, died when he was 3. Bull said that his father, a prominent criminal lawyer from Trenton, Ont. who was a heavy drinker, abandoned his nine children. With some of his brothers and sisters, Bull was taken to Trenton, Ont. by his father’s eldest sister, who died of cancer one year later. Bull was then handed from relative to relative until at the age of 6 or 7 he was adopted by his mother’s brother, who had no children of his own. The remaining members of the family were scattered across Canada and brought up as Protestants. Bull, who was brought up as a Catholic, says he never saw his brothers or sisters again because of religious differences. He was brought up by his uncle and aunt near Kingston and received individual tutoring seven days a week from the Jesuits. By the time he was 9, he had already completed Grade 9. It was during the Second World War, when he was a teenager, that he developed his fierce patriotic feelings and his intense hatred of fascism and communism. Many of his classmates, who were six years older than him, were called into the Canadian Forces to serve overseas. Some lost their lives, including a cousin who acted as his big brother and whom Bull hero-worshipped. Dr. Bull designed the Project Babylon "supergun" for the Iraqi government. Bull himself was rejected for military service because he was too young, but it wasn’t long before he was being courted by the Canadian government to work on defence projects. In 1950 he became the youngest student to graduate with a Ph.D. in aeronautical engineering from the University of Toronto. After intensive wooing by the Canadian government, Bull agreed to work on the guided missile program at the Canadian Armaments and Research Development Establishment (CARDE) at Val Cartier, Que. Dr. Charles Murphy, a U.S. associate of Bull’s at Val Cartier, recalls that Bull always wanted to do things that people said couldn’t be done. 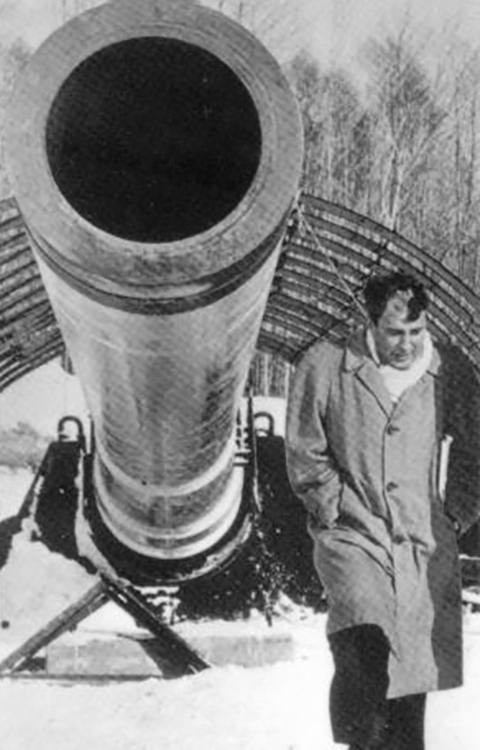 During 10 years at Val Cartier, Bull received wide recognition for his technical work, such as using big guns to launch airplane models for testing the guided missiles. And with it came press coverage, including an interview in the magazine Maclean’s in November, 1952. Bull was critical of the Canadian government for putting a freeze on all defence spending in the late 1950s. What he considered to be the lack of Canadian defence policy led him to resign in early 1961. He took over as director of McGill University’s High Altitude Research Project (HARP), where he used his knowledge of artillery guns to launch sophisticated instruments to explore the earth’s atmosphere. Prof. Donald Mordell, head of the McGill engineering department at the time, was delighted to hire Bull for the HARP project. McGill engineers, led by Bull, set a world record gun-fired probes into the upper atmosphere by firing 375-pound projectiles from a 18-inch U.S. Navy gun to an altitude of 300,000 feet — nearly 57 miles. It was thought the gun-fired probes would allow the exploration of space at a fraction of the cost of using rockets and missiles. McGill had early and considerable financial help from the U.S. Army and by 1965 received some help from the Canadian government. But in 1967 over Bull’s protests, Canada withdrew its funding. Bud Drury, now head of the National Capital Commission, was industry minister at the time the HARP funding was cut off. “The reason we got out of the program was a desire on the part of the good doctor to pursue high altitude research for defence purposes rather than strictly for non-defence purposes such as communications,” Drury said in a telephone interview from Ottawa. “Dr. Bull is a first class scientist. He has great talent. He gets spectacular results with meagre resources. But someone like Bull will do well what he wants to do and won’t do at all what he doesn’t want to do. He wanted to do defence research in the upper atmosphere, which didn’t jive with the policy of the Canadian government. 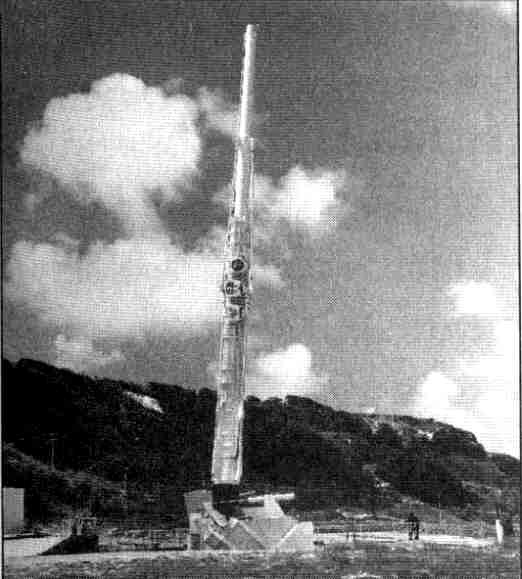 However, Mordell recalls that the HARP scientists had developed sophisticated electronic communications satellites and were within a year of launching one into orbit when the funding was cut. At the urging of the U.S. government, which wanted him to continue his gun research, Bull used his own money and that of other private investors to establish SRC at Highwater, where he had a country home and lots of land for gun-firing tests. He established an administrative centre on the U.S. side at North Troy since most of his work was done for the U.S. Army and Navy. He estimates SRC did a $100 million worth of work over 10 years, mainly from U.S. Army contracts during the Vietnam war. At SRC, Bull employed 400 people, including about 100 scientists, the majority of them Canadians. The scientists have returned to private industry, many of them in the U.S. In January 1973, Bull became a U.S. citizen by a special act of Congress to allow him to operate with full military security clearance for the U.S. armed forces. Canada at the time forced him to give up his Canadian citizenship, for which he never re-applied. But Bull says he never wants to hear of Canada again.